The first scholar I read who carefully laid out a position on the whole meaning of it all was the leading Christian philosopher Richard Swinburne. I rolled up my sleeves and plunged into recent philosophers' theories and historical writings and controversies. We'll see if he actually deals with the words of Scripture. These seem to be reasonable things to say. But my experience with anti-Trinitarians is that they want a doctrine of God that is comprehensible. A doctrine without mystery. A doctrine that doesn't make one's head hurt. But the fact is, while God is describable, He isn't comprehensible. His essential nature is so utterly foreign to our way of thinking that we cannot wrap our minds around Him. We see things that are far from what we would guess. We see things that are very far from what we could have imagined and so our imagination is stretched to the utmost … just to comprehend the things that are there. [Nature behaves] in a way like nothing you have ever seen before. … But how can it be like that? Which really is a reflection of an uncontrolled but I say utterly vain desire to see it in terms of some analogy with something familiar… I think I can safely say that nobody understands Quantum Mechanics… Nobody knows how it can be like that. The reason why I inject Quantum Mechanics into a discussion of the Trinity is not because I think that Quantum Mechanics has anything to do with the Trinity but, rather, to show how people deal with mystery. For the last 100 years scientists have had to deal with the perplexing nature of Nature just as for the last 2000 years Christians have had to deal with the perplexing nature of God. Both groups do the exact same thing. They either embrace the mystery or they try to spin theories to remove it. The "Copenhagen" interpretation of Quantum Mechanics says "embrace the mystery." Feynman, in his lecture, spoke of "the paradoxes and mysteries and peculiarities of Nature" and said "if you will simply admit that Nature does behave like this you will find her a delightful entrancing thing." David Merman said, "shut up and calculate." Other interpretations, such as "Many Worlds" or "De Broglie–Bohm theory" try to remove the mystery (unsuccessfully, IMO). And this leads to the next chapter in Tuggy's book. He begins by noting how to tell one "enemy" from another because, after all, Trinitarians and anti-Trinitarians are warring factions. I am reminded of one scientific equivalent, "The Crackpot Index." It's one thing for a genius to not accept the status quo and to come up with something revolutionary and stunning. It's another thing for a dimwit to go off in the weeds and think he's on the road to treasure. The correct response to "but they laughed at Einstein" is "they also laughed at Bozo the clown." Life is too short to miss the geniuses because you're surrounded by midwits and so, like the word "Shibboleth," we develop rules of thumb to help quickly distinguish between the two. He then notes that while both sides regard the opposing theology with disdain, many Trinitarians don't really have a deep understanding of what they proclaim they believe. While true, it's irrelevant. You don't get to brag about how fast you are if you can win a race by running against cripples — you only get to brag if you can beat Usain Bolt. He mentions the dictum, "Try to understand it and you'll lose your mind. Try to deny it and you'll lose your soul." This dictum is nowhere in Scripture, but it's partially similar to "Embrace the mystery" and "Deny it and lose your tenure." He attempts to show an incoherence of the doctrine of the Trinity by the thought experiment of meeting a new neighbor with two women who the neighbor claims is his "one wife." This immediately tells me that Tuggy doesn't understand the doctrine he wants to undermine and right away gives him 5 points on The Crackpot Index via rule 6. God is immaterial. All analogies using material things fail. There is no physical thing you can point to and say "God is like that." And this illustrates a rule that I suspect Tuggy will violate again and again, namely, you have to deal with the arguments made by your opponent — not the arguments you think they make. The entire chapter is an irrelevant distraction but it, again, hints at Tuggy's fundamental problem when he writes, "Is the subject impenetrable? Maybe" and he adds the footnote "In chapter 8 we'll consider claims that the Trinity is a mystery which we'll never solve in this life." I suspect I'd live a lot longer and be a lot happier if I immediately skipped to chapter 8. Chapter Two has a very promising title: "Formulas vs. Interpretations." One would hope that the author would do here what Feynman did in his lecture. Show the double-slit experiment, provide the formula(s) which describe it, discuss the various interpretations, and then show where each interpretation supports, or differs, from the formula(s). This would be the perfect place to show the Scriptural "formulas" around which the various interpretations develop. Tuggy confuses credal statements, which are interpretations of Scripture, with Scripture itself. Nowhere in this chapter, or anywhere else in the book, does he deal with John 1:1 which, in my opinion, is the Trinitarian equivalent of the double-slit experiment. It is the source of the mystery, since it asserts that something was in the beginning with God, is distinct from God, and yet is divine. If there was more than one divine thing then this wouldn't be a problem, but there is one — and only one — God. Just as we find Nature utterly puzzling, it should come as no surprise that we find God is even more so. But the creedal statements won't make sense unless you understand how they were developed as an alternate way of saying what Scripture says. In Chapter Three, Tuggy mainly sets forth how he will use various terms. As long as he is consistent through the rest of the book, then fine. If only he were just as careful to learn how Trinitarians define their terms. His discussion about homoousion in Chapter 2 was painful to read. The early writers were struggling with how to describe something that is immaterial. It is more properly thought of as "ontological category" than "stuff". Chapter Four begins with a parable that should be an embarrassment to anyone trying to comprehend the nature of God. It's an embarrassment because no physical analogies can accurately describe God. It's like describing a photon as a particle or a wave. A photon is neither of those things and there is nothing in our everyday experience to which we can liken them. He writes, "we all know that one being can't be and not be in certain way, at the same time and in the same way." No, we absolutely don't know that. We already have an example in Nature of something that is beyond our comprehension. If the stones would shout out about God (Lk 19:40) they would tell a very baffling story. But at least he ends the chapter on a promising note: "The next steps would be showing that Jesus is divine in the same sense as the Father and the Spirit, and that these three in some sense are or are in the one God." Is he finally going to actually deal with Scripture? No, he is not. Yes, Acts 5:3,4,9 appear, but in a footnote. Tertullian's exposition of Proverbs 8 is cited, but not Proverbs 8 itself, and John 14:28 is quoted. That's it. What Tertullian believed or what Origin believed are interesting from a historical perspective, but there is no discussion of how they came to their beliefs: what is it in the source material as well as their intellectual environments that would lead them to these conclusions? In chapter 6 he asks what is meant by "person," since the Trinitarian view is that of one God existing in three persons. He is on the right track when he says that a "person" is something that can use words like "I," "me," and "my". But then he goes completely off the rails when he says "… a being who can be conscious. But even worms, probably, are conscious." Worms react to their surroundings, but so does a thermometer. If a thermometer isn't conscious, but a worm is, what causes the division? Clearly, some kind of computing device, whether a neural net or something else, is needed for consciousness in created things, but does a worm have a sufficiently complex neural net for consciousness? A self-driving car will be aware of its surroundings and have some notion of itself — because it has to be able to know where it ends and a pedestrian begins. If the car says, "I'll take to you the grocery store", is it self-aware? Is it a person? An African gray parrot named Alex was being taught the names of colors. When looking at himself in a mirror he asked, "what color?" He demonstrated the ability to apparently distinguish between "you" and "I". Was Alex self-aware? If we have trouble understanding what it means for physical things to be self-aware, it's understandable that Trinitarians pause when asked what it means for an immaterial unchanging transcendent something to say "I am that I am" while the eternal uncreated Son says "I and my Father…" The author continues his stubborn, yet thoroughly unwarranted, insistence on the reliability of "common sense" when he writes, "Both views [the view of some forms of Hinduism that teaches that there is only one self and the view of Buddhism that there are no selves, though there appear to be], I suggest, cut against common sense which acknowledges that you're one (real) self and I'm another self." The problem with this is that we don't know what makes a "self." For all we know it's the same immaterial "I am" stuff in different physical arrangements (since brain wiring, like fingerprints, is unique for each individual). Putting a label, "self," on a mystery doesn't give us any real understanding of the mystery. Chapter 7 focuses on the meaning of the Greek word ousia since the Nicene creed declares that the Father and the Son are homoousion (same essence or being). As I mentioned above, think of it as "ontological category." They are in a class by themselves — a class which is completely outside anything we are familiar with. And, yet again, Tuggy insists that it is familiar. He writes, "But it is self-evident that that nothing can, at one time, or eternally, qualitatively differ from itself." Except that John 1:1 says that Tuggy is wrong. The logos was with God (different) and the logos was God (same). John 1:1 could be translated that the logos was divine, but there is one and only one divine being, so God. In any case, the chapter provides nine options for what ousia might mean when speaking about God. Option 2, "same universal essence" is the right option. But his interpretation on what this means is wrong. He writes, "[the problem] is that to be divine is to be a god [emp. mine]." Well, no. To be divine (in the sense of being uncreated, eternal, immaterial, unchanging, self-aware, …) is to be God. There is one, and only one, being of this type. If chapter 7 dealt with the meaning of ousia, chapter 8 attempts to deal with the meaning of mystery. And here we finally read something worthwhile. On the one hand, he notes that mystery can mean "a reality greater than we can adequately or fully understand." A Trinitarian would certainly claim that this applies to what God is. But he also writes that the mystery of the Trinity is a way of "stopping the conversation" because "the difficulty at hand, whatever it is, is insurmountable, something our best efforts cannot resolve." 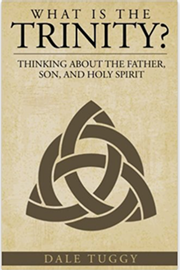 And, this too, is exactly what the Trinitarian says. We're incapable of resolving it. Yet Tuggy says that this use of the word mystery is "a ridiculous claim." It's "[ridiculous] that the difficulty is unresolvable, something that the human race, or the Christian community, must just accept and learn to live with." Why is this ridiculous? Scripture is silent to the theological question, "is the mind of man capable of fully comprehending the nature of God?" Tuggy says "yes" and I say "no." If Tuggy has a basis for his claim, other than human vanity, he doesn't say what it is. At least I can point to the fact that Nature itself is inscrutable. Einstein didn't believe that the moon doesn't exist unless it is observed, but it doesn't. Take the time to read "Is the moon there when nobody looks? Reality and the quantum theory." Even if the technical parts escape you, notice the language used to described how utterly perplexed physicists are by what Nature is telling them. See also this additional explanatory material. Feynman said, "We have always had a great deal of difficulty understanding the world view that quantum mechanics represents." Pais said, "no reasonable definition of reality could be expected to permit this," and Merman said, "shut up and calculate." Of course there are those who don't like this. An external limit placed on us by Nature is no different from an external limit placed on us by God. And we know from Romans 5:20 that these external limits increase our desire to rebel against them. Of course there are those who think they can somehow resolve it. All they need do is finish construction on a tall enough tower so that we can look out and see the answer. And with this, reviewing the rest of the book would be beating a dead horse. For a more edifying take on the subject, see Nicaea and Its Legacy: An Approach to Fourth-Century Trinitarian Theology by Lewis Ayres.